This spring most parts of Iowa have had plenty of rainfall, causing many producers to enter fields at less-than-ideal soil conditions. High soil moisture increases soil compaction caused by field traffic and machinery. Over the past decade the size of Iowa farms has increased, leading to larger and heavier equipment. However, equipment size is only one factor among many causes of the soil compaction problem. Rushing to the field when the soil is wet can increase chances for severe soil compaction combined with the weight of equipment and traffic pattern in the field. Conducting field operations during wet field conditions compounds the amount of compaction occurring. Maximum soil compaction occurs when soil moisture is at or near field capacity (Figure 1) because soil moisture works as a lubricant between soil particles under heavy pressure from field equipment. Figure 1. Moisture-density curve for a medium-textured soil for a given compactive effort. Indications of soil compaction during and immediately following a normal rainfall include slow water infiltration, water ponding, high surface runoff, and soil erosion. Additionally, soil compaction can be diagnosed by stunted plant growth, poor-root-system development (see photo below), and potential nutrient deficiencies (i.e., reduced potassium uptake). These soil compaction symptoms are a result of increased bulk densities that affect the ideal proportion of air and water in the soil. The most efficient way to verify soil compaction is to use a tile probe, spade, or penetrometer to determine a relative soil density. Soil moisture conditions can have a significant effect on penetration resistance. For example, in dry soil conditions soil penetration resistance is much higher than wet conditions because soil water acts as a lubricant for soil particles. Therefore, it is wise to determine soil compaction early in the season or compare observations and measurements from suspected areas with adjacent areas that have little chance of soil compaction due to traffic patterns. First, the most effective way to minimize soil compaction is to avoid field operations when soil moisture is at or near field capacity. Soil compaction will be less severe when soil tillage, fertilizer application, and planting operations occur when the field is dry. Soil moisture can be done using a hand ball test or observing a soil ribbon test. Second, properly adjust tire size and air pressure. Larger tires with lower air pressure allow for better flotation and reduce load on the soil surface. Additionally, by using larger tires that are properly inflated increases the "footprint" on the soil. Third, use the same wheel tracks to minimize the amount of land traveled across. Most damage occurs with the first pass of the implement. Using control traffic patterns can be done effectively by using implements that are the same width for soil preparation, planting, row cultivation, spraying, and harvesting. Soil compaction can be a serious problem for Iowa farmers, but with proper farm management, compaction can be minimized. Remember to hold on soil tillage operations until soil conditions are drier than field capacity and look into the benefits of conservation tillage systems. 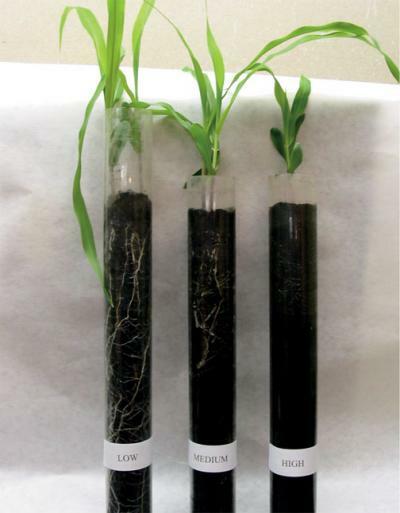 Effect of soil compaction on root growth at three different soil bulk densities: Low, 0.7 g/cm3; Medium, 1.1 g/cm3; High, 1.6 g/cm3 (Stephanie Nelson, Honors Program project). This article originally appeared on pages 78-79 of the IC-494 (9) -- May 9, 2005 issue.